How to Make a Good Impression on the First day? There is some truth in the common saying that ‘first impression is the last impression ‘so you should make sure that when you embark on a new journey and start working for a new company you ensure that from the very first day itself you give it your best shot. When you give your one hundred percent in whatever task that is entrusted to you then you do not give people the opportunity to criticize you on any basis. Here are some of the ways in which you can make a good impression on your first day at work! On the first day of work it is an unwritten rule that you come early so that you can familiarize yourself with the work environment as well as inquire about where you are to be seated or who you must report to. It creates an extremely bad impression when you arrive late on your first day of work, giving juvenile excuses like I had trouble finding the place, I got up late, my car broke down or there was heavy traffic. Now that you have been appointed to be a part of a company, you represent them. You must make sure that you dress well at all times because one can never tell when a client or the CEO of the company might decide to land up at the office on any particular day and at any given time. You are never going to create a good impression if you arrive on your first day of work looking as though you simply tumbled out of bed. First days at work are not easy for anyone however you should make sure that you do not let your nervousness get in the way in which you work or present yourself. Being nervous is alright because after all you are embarking on a new journey of your life, but being timid could really create a bad impression. In this day and age, where there is cut throat competition between companies, employees need to be daring and bold enough to rise to any challenge. One of the most effective ways to create a good impression on your first day of work is by showing that you are very eager to learn and improve yourself. Companies do not appreciate it when new employees pretend like they know it all and do not think it necessary to heed the warnings and listen to advice that is given to them. If possible while you’re senior or boss is giving you instructions you should either make a mental note of it, or else it would be better to jot it down on a notebook. From the very first day you should let your mannerisms speak for themselves such that people get the drift that you mean business. No matter how young or inexperienced you are you should not let that come on the way of how you conduct yourself. You should remember that this is your place of work and it is on the basis of how you conduct yourself that people are either going to take you seriously or dismiss you as a childish and naïve individual. First days at any workplace can be daunting, but make sure that you use the day to acquaint yourself with what is required of you. It would greatly benefit you to read up on the internet what is required from a person who is employed at your designation, before arriving at work. If you have been employed as a secretary then read online about what are basic requirements and duties of any secretary. Having a little prior knowledge about your responsibilities could really impress your boss but it is only when you start working that you know exactly what is required of you. Since it is your first day, you should go out of your way to introduce yourself to everyone that you meet. It is not merely enough to tell them your name you should also ensure that you give them your designation. When you take this first step on your own, it will silently communicate to the rest of the workers that you are an outgoing person who has good communication skills and this is exactly what companies are looking for in all their employees. On your first day of work it would benefit you to speak only when required. There will be many helpful individuals who you might meet so it would be befitting for you to listen to whatever they have to say. While conversing with people make sure that you do not talk about too many trivial things which are in no way related to your work. You create a good impression when you show that in addition to being a good speaker you are also a good listener. The moment you are assigned a cabin or a cubicle ensure that you begin organizing your station. Begin either by arranging files in the cabinet or clearing the desk that might have things on it that belonged to someone who used to sit there previously. Being neat and tidy is a silent testimony to the fact that you are extremely methodical and organized. Nothing creates a better impression on your first day than showing that you are an organized person who gets to work immediately. No matter how daunting the job might seem on the first day, you should ensure that you keep a positive outlook. When your senior or boss is briefing you about your respective duties ensure that you do not show signs of fear. Do not think that you are going to fail at the job simply because your responsibilities sound like they are a lot. Give it your best shot and you will surely succeed. Nothing creates a worse impression than a person who anticipates failure before embarking on the job. Remember you would not have been hired if they did not think you were capable enough to handle it! Trying to make friends on your first day of work is good, but ensure that you do not end up getting over friendly with anyone you have just met! Even though you might not know it, in the work place you are constantly being watched. It creates a very bad impression if you were to forget your professional boundaries and act in a way that is unbecoming of a new employee. Over time if you are able to forge friendships with employees it is a good thing but initially your primary focus should be your work. On your first day it is natural to have many doubts and queries so you should not hesitate to ask your colleagues or seniors questions, in all likelihood they would be only too happy to help you. It is better to ask questions than to make mistakes later on when you are carrying out a job. When you ask questions it shows that you are eager to seek advice and learn from the mistakes of others as well, this is a quality which is rare to find in people and it will surely help you make a great impression. Nothing helps create a better impression than showing right from the first day that you are not at all interested in being involved in petty office politics. Irrespective of how young you are, show that no matter what, you are always above engaging in such meaningless frivolities. People always respect individuals who do not follow the crowd but have the guts to stand on their own two feet and air their views independently. Even if it is your first day and people tend to leave early on their first day you should complete your work and leave not a minute before time. 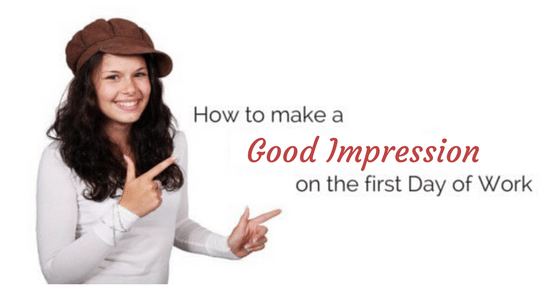 This will help you create a great impression on your first day at work. So even if you have completed your quota of work, you could always assist someone else. In addition to making a good impression for yourself you also convey that you are a team player and unobtrusive individual. These were some of the simple things that you could do to help create a great impression on your first day at work. Just remember that even if your first day does not go very well, things will get better over time, just hang in there, stay focused at all times and continue to do your bit.